Every year for Christmas one of my awesome co-workers gets me a tub or two of this amazing caramel popcorn. She knows how much I love it, and I am so lucky to have great co-workers who give me some pretty wonderful gifts in our gift exchange each year. I always seem to find inspiration in the funniest places. I was browsing around Walmart one evening, as I like to do when I just cannot think of gifts to get anyone, and I noticed the Planter’s display. 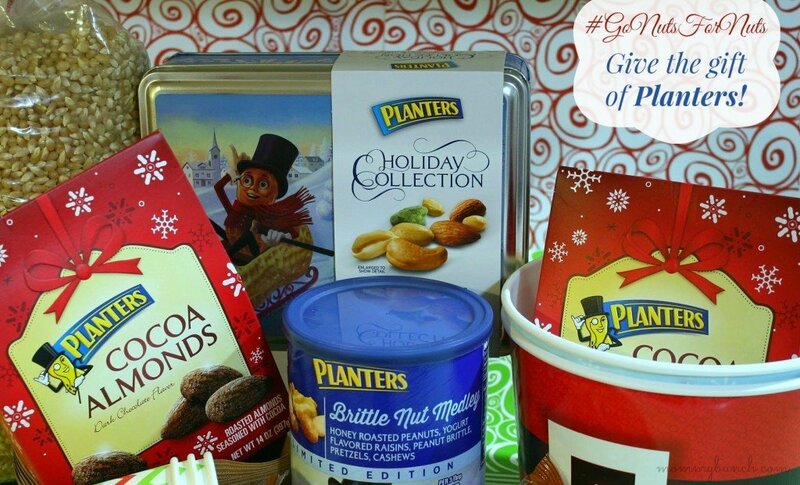 My mom will literally #GoNutsForNuts – she eats nuts by the tubful so these holiday tins are exactly the perfect gift for her. But I couldn’t just stop there, oh no – I have to go all out! Seeing those cocoa almonds (which my husband and I have not been able to stop devouring since I brought home a few bags) got me thinking about that awesome popcorn munch, and I knew I had to make some! 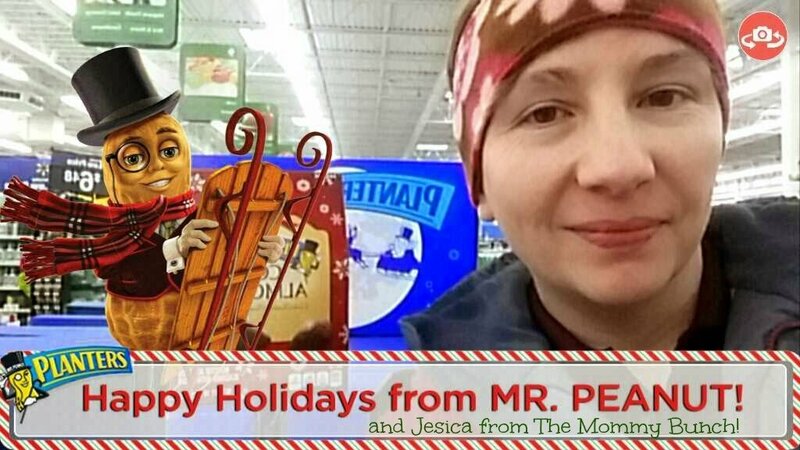 On a side note, I used the Blippar App with the Planter’s Cocoa Almond bags and it brought up the cutest little wintery scene where Mr. Peanut asks you if you want to take a selfie, browse seasonal items, look at the peanut gallery, or find recipes. I obviously needed to take a selfie! 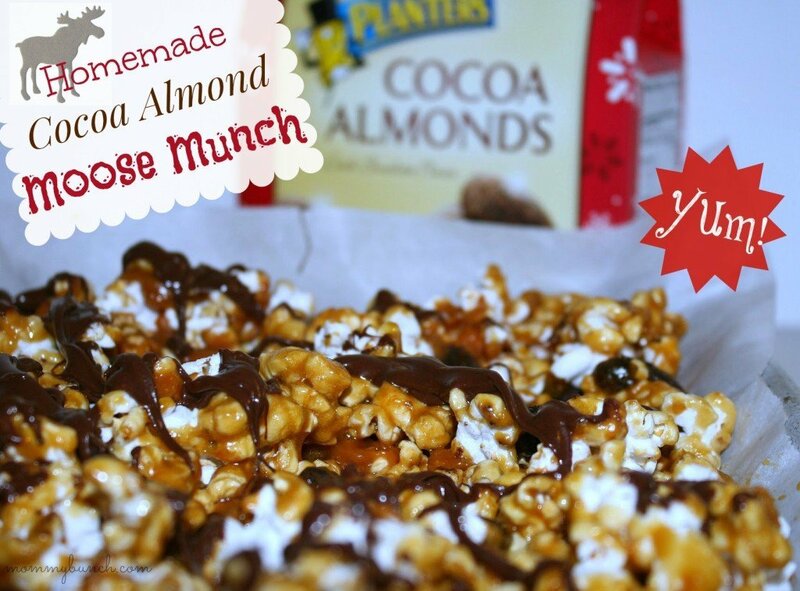 Cocoa Almond copycat Moose Munch! Making the Moose Munch is really simple. 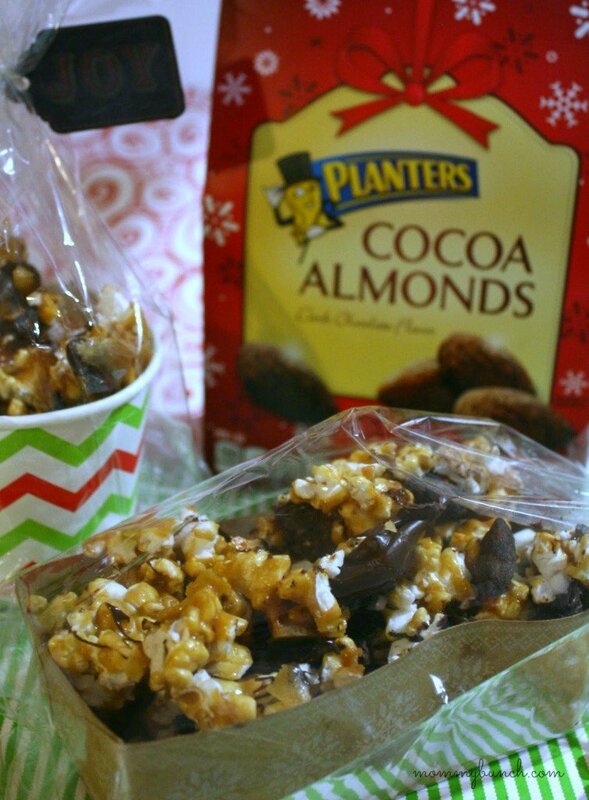 You just need some popcorn, some caramel (homemade or store-bought), some chocolate, and some Planter’s cocoa almonds <- that’s the secret ingredient that really makes these super yum, so don’t forget to grab a bag! 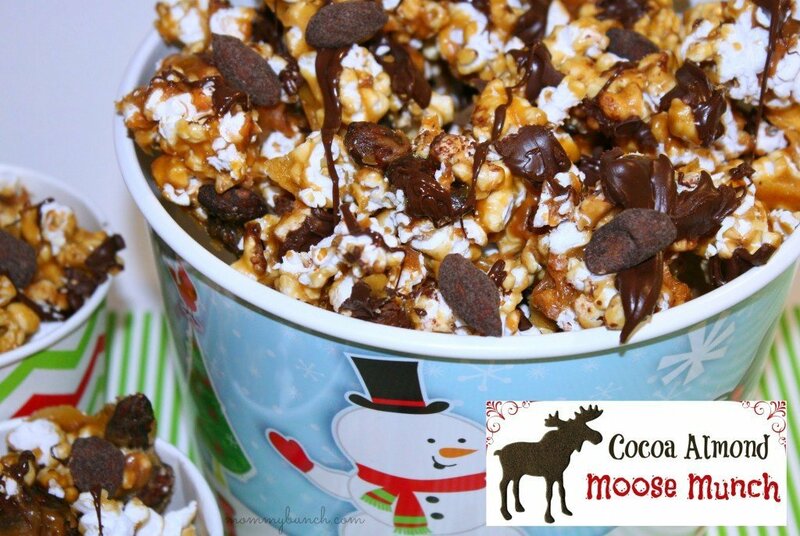 This super yummy Moose Munch Caramel Corn with Cocoa Almonds will have you begging for more. 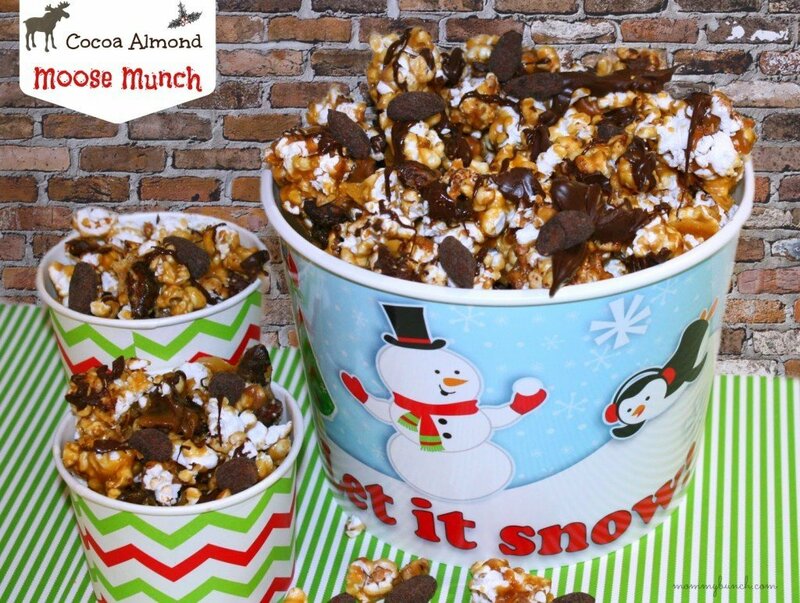 Perfect for gift giving or movie night – there is always an occasion for Moose Munch! Pop popcorn in an air popper or a paper bag in the microwave. Spread popcorn on a sheet pan lined with parchment paper or in a buttered roasting pan. Use two pans if it doesn’t all fit in one. Sprinkle a 3/4 of the almonds throughout the popcorn. In a heavy bottom saucepan, melt the butter, corn syrup and brown sugar. Cook over medium heat for about 5-8 minutes, or until boiling. After boiling begins, continue cooking at a boil for 2 minutes. Remove from heat and stir in baking soda. The mixture will bubble up so add carefully. Pour warm mixture over popcorn and nuts and stir well so the popcorn is coated. Remove from over and transfer to entire parchment paper to cooling rack (if using roasting pans transfer to parchment lined cooling rack). Once cooled, melt chocolate chips with olive oil in the microwave in 30 second intervals, stirring after each one. You can also use a double boiler. 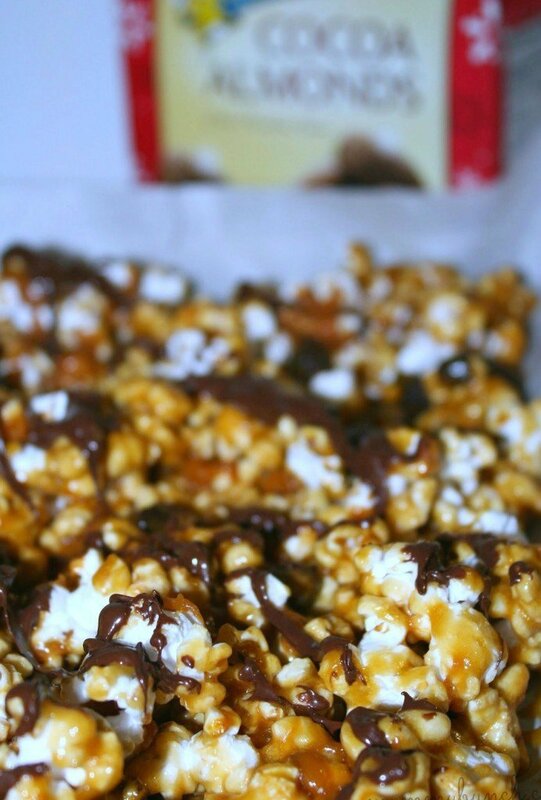 Drizzle chocolate over the popcorn and let stand 3-4 hours until the chocolate is set. Break into pieces, add remaining almonds as garnish when you serve. Enjoy! What you end up with is the best-tasting caramel popcorn (seriously so good) that is made even better with the addition of chocolate and cocoa almonds! This makes a great snack for movie night. I am also packaging some up to give as gifts for our neighbors and family this holiday. What a great gift to show how much you appreciate someone! If you need more gift or recipe ideas for inspiration, check out the Cooking Up Good website. They have recipes, sweepstakes, loyalty programs, coupons and more! What’s not to love? You might come across another fantastic recipe that will work great as a gift as well! Not sure if you have the time to whip it all together? 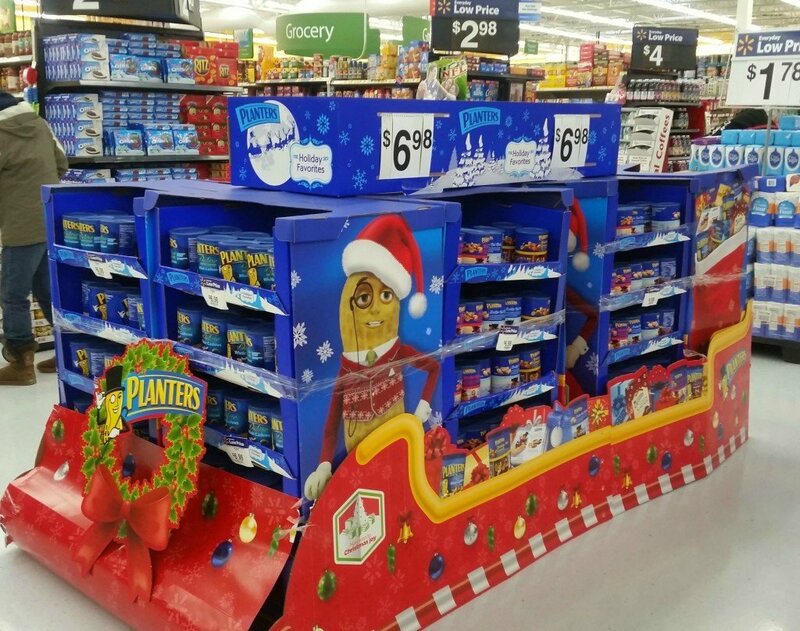 No problem, Planters nuts and some popcorn make great gifts all on their own! I know for sure that my dad is getting the Holiday Collection tin, and my mom is getting the Brittle Nut Medley. I think my husband and I will keep the Cocoa Almonds for ourselves, they are just so darn good I don’t think we will be able to hold onto them until Christmas! To make this gift even more special I whipped up some super easy printable gift tags. Simply print on card-stock, or regular paper if you don’t have card-stock, and attach with a piece of twine or ribbon. It gives your homemade gift that extra little personal touch everyone is sure to appreciate. To print your own, simply download the free printable here – six different designs included. Now just sit back and enjoy the fruits of your labor – because you have to make an extra tray just for yourself, gifting all of this to everyone else would be no fun at all! PreviousLeapTV is here and we love it! NextThe perfect gift for your pet! Reading Horizons – Your Complete At Home Reading Curriculum!